Compact appliances are ideal for creating a bespoke kitchen space that works for you and your family. Whether that is building a microwave into the cabinetry of your kitchen or adding a worktop microwave for easy and convenient cooking, we have put together a stylish and practical range for you to choose from. Think microwaving is all about baked beans and baby food? Think again! Not with specialist cooking functions for pizza, meat, sauces and veg you can get perfect cooking results in your microwave at every mealtime. We’ve also added useful grills, defrost settings and programming functions to take these microwaves from the everyday to the extraordinary. Designing your kitchen with a built in microwave is ideal for freeing up worktop space and creating an easy to use and clean-looking cooking station in your kitchen. We offer two options, one that has been created to fit in a wall unit and the other that can be built in seamlessly to your kitchen cabinetry. 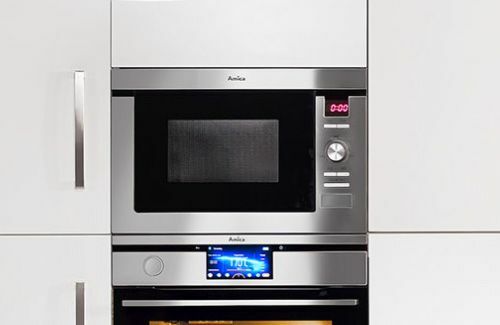 Either way, both models are finished in a professional and clean stainless steel with simple and functional control panels that allow you speedy control of their specialist programmes, power levels, timers, defrost settings, cooking and grilling functions.